In The Division 2 SHD points are an essential form of currency as they can be spent with the Quartermaster located at the White House to unlock various perks to increase the effctiveness of your agent. This SHD Points guide will show you the three ways they can be earned so you are able to unlock all of the available perks and make your agent more potent in combat. Whenever you level up you will receive a single SHD point. Although this is the quickest way to acquire the points and then use them on perk upgrades you will soon discover that the higher level perks cost more SHD points, this means you will have to rely on the next two methods to get them if you want to obtain all of the available perks. 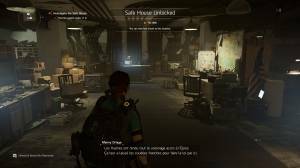 In The Division 2 you will unlock side missions when you advance to new areas. These side missions will be marked on the map with the orange Division eagle attached to them. This symbol indicates that the mission will award you one SHD Point when you complete it. There are a multitude of side missions you can complete, some of them just as tough as the story missions. Due to the outbreak of the deadly Dollar Flu virus which has caused chaos in Washington D.C. many safe houses were abandoned and shut down. If you revisit these safe houses and reactivate them you will earn SHD Points. This is done by entering the safe house and activating the computers inside so you get a list of tasks to complete in the area. This will also include waypoints of various SHD cache locations scattered throughout the district which will reward you SHD Points when you visit them. Check out our Safe House Guide to find out more about these safe havens.